THERE is a Malay proverb that goes ‘kecil jangan disangka anak; besar jangan disangka bapa’, which can be translated as, ‘just because someone looks small, do not think that he is a child; but just because someone looks big, do not think he is a father’. The same saying can be applied when you look at a small handheld cannon – do not let its small diminutive size fool you. That small handheld cannon can pack a mighty punch. 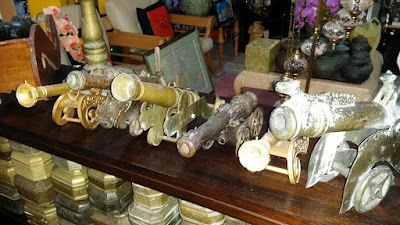 In the book entitled “The Might of the Miniature Cannon: A Treasure of Borneo and the Malay Archipelago” (2005), the author, Alex Teoh E K, noted that the miniature cannons manufactured in Brunei and the surrounding Borneo island were the preferred monetary tender, desirable marriage dowry, payment for fines, treasure heirloom and a status symbol. The small cannons were not used in battles or wars even though they were technically capable of being fired and can theoretically hit and kill someone. 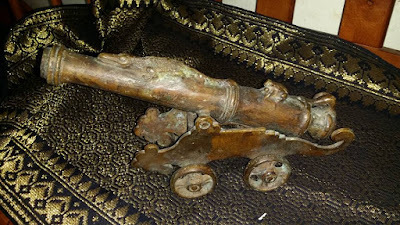 Pengiran Dato Sharifuddin writing about the Brunei Cannon (1969) in the Brunei Museum Journal described the cannons as “although they look like toys to strangers, they can be dangerous at close range, like a pistol”. Alex Teoh described that with over four hundred years of cannon-making history, the Borneo region is reputed to make the finest cannons in the Asian region. Comparing the cannons manufactured in Brunei and Borneo, the Borneo cannons are superior in both workmanship and finish, compared to the cannons made in Terengganu in Malaysia or Acheh in Indonesia. Brunei and Borneo cannons also have better finishes, ornamentation and decorations compared to the ones made by Europeans. However the European cannons have a longer firing range and is much heavier in comparison to the Brunei and Borneo cannons. This is due to the purposes and multiuse of the local cannons as they were not just used as weapons but also as instruments in both the economic and socio-cultural settings. Cannons in the region are used for decoration, that is, they were installed in boats to decorate and show the importance of the boat owners. A pirate ship does not carry it merely for decoration purposes but to show their might to those who disobey them. Cannons were also used as a means for communication. They are fired for signalling and warning, where they were usually placed in strategic locations like a fort, riverbank or hill. The cannons can be fired to signal the approach of the enemies or suspicious vessels. In Brunei, cannons are still fired to mark the end of each fasting day just as cannons are used to transmit important messages including the announcement of a royal birth or a death. Cannons were also used for royal family ceremonies. The number of cannon shots determine the rank and importance of the person being celebrated. Most importantly, the cannons were used as a token or as a medium of exchange to facilitate trade and socio-cultural activities.It was used as money to trade for goods, especially in purchasing rice and jungle products. In an article “Malay Cannon” (1947) written by GC Wooley and published in the Journal of the Malayan Branch of the Royal Arts Society (JMBRAS), cannons had value as currency. The ordinary gun, with normal decoration, was valued at approximately $25 to $30 a pikul. A pikul, an old Malay weight system, was equivalent to 100 katis which worked out to be around 60 kilogrammes. A good metre-long cannon would weigh around 60 kilogrammes. Fines could also be paid by using cannons. Fines for the more serious offences could be expressed in terms of ‘so many pikuls’, and the offender could then use as many cannons of equal weight to pay the fine. Wooley also noted that the cannon also formed a regular item in “Brian” or wedding dowry from the groom to the bride. A cannon was not difficult to store, and in most cases were stood up and tied to a house post, which can still be seen in some long houses nowadays. Cannons would not deteriorate by rusting away whereas other forms of dowry may not last as long, including animals which could die. Futhermore, cannons can be used to fire at intruders if need be, or to be fired on festive occasions. But nowadays, cannons became very valuable when they are not as large as the normal ones. A number of exhibits at the Currency Gallery of the Brunei Currency and Monetary Board – next to the Ministry of Finance building – showcase miniature cannons between six inches and 12 inches long, that were once used as currency in Brunei, in place of coins and other monetary tokens. It was said that the value of these miniature cannons in those days can be as high as $30 (straits dollar) each. Nowadays, each could easily cost around $400 to $1,600 depending on the size, condition and rarity of the cannons. Miniature cannons are generally between 10cm to 60cm in length. They are designed and decorated like their larger cousins. Interestingly enough, they are also designed in the form of a fat buffalo, crocodile and can be single or double barreled. 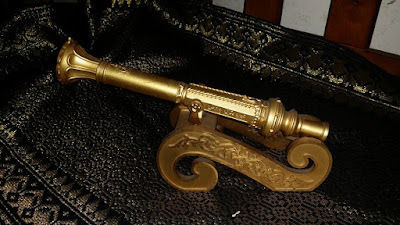 Pengiran Dato Sharifuddin noted that the miniature cannons have been made for a long time in Brunei, and they continued to be made long after the firing days were over. They were used to open ceremonies; drive away evil spirits and epidemics; and generally for spiritual purposes. Pengiran Dato Sharifuddin also noted that there are many variants of miniature crocodiles, and or of ordinary barrels decorated with crocodiles and other motifs, especially butterflies. Buffaloes also make up the other most striking and distinct miniatures. It was not just in Brunei and Borneo that these miniature cannons play important roles. They were also used in Indonesia, especially during the Portuguese and Danish colonial rule, as currency for trade in spices. The demand became overwhelming that the Dutch and Portuguese cast them in their own countries. The more varied designs in Brunei suggests that there are influences of her trade partners over the centuries such as China, India and the Middle East. Alex Teoh noted that these miniature cannons play important roles in the economy as well as in socio-cultural. The intricate decoration of the barrel and elaborate detailing of design and engraving suggest that the miniature cannons could also have played a part in the spiritual and magical use. Whatever the previous usage, the small miniature Brunei cannons are indeed of historical significance, and deserved to be preserved and valued. They make excellent display and conversation pieces and can become excellent investments.